Thursday February 25, 2016 - The continuing story of State House-endorsed corruption. Who benefited from the collapse of the 28 million dollar World Bank-funded West Africa Regional Fisheries Project? Why was this kept under wraps until the World Bank representative blew the cover off? 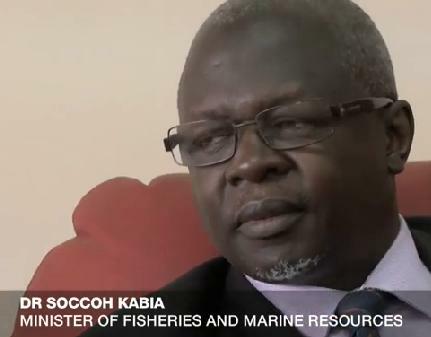 It was a press statement on the State House website titled "President receives Report on Fisheries Project" that could well have alerted many to a part of the goings-on at the country's ministry that is responsible for marine resources. The report delivered by one Dr Max Amadu Sesay revealed that indeed investigations had been going on into a failed project and this after one Parminder Brar, World Bank Country Manager in Sierra Leone told the press that for the past two years, a key component in the fight against illegal fishing had been rendered non-operational. According to the Freetown-based Concord Times news outlet, some twenty eight million dollars spent on the project had almost come to a grinding halt - not for 2 weeks, nor two months, but for two years and this under the watch of the rat who knows all too well the amount of revenue that could be derived from our marine resources, even without the help of one Haja Enkincha. "Before we started supporting the sector, there were 80 trawlers doing fishing [in the country’s waters]. When we started that number was reduced to 30 because of the Joint Management Centre (JMC) that we set up to monitor illegal fishing,” said Brar, adding however that currently, the number of foreign trawlers has increased again to 80 and that there is 60% illegal fishing going on in the country’s territorial waters." 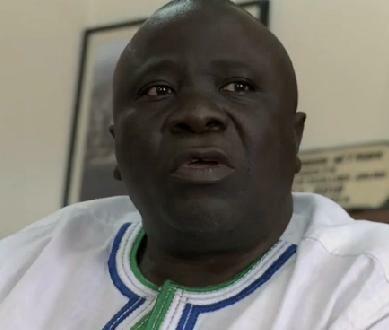 Another factor was the collapse of the Joint Monitoring Centre, which used to monitor illegal fishing activities in the waters of Sierra Leone, he added and disclosed that the JMC was destroyed by lightning some two years ago. “Currently there is no satellite and internet connection at the JMC in Murray Town, and there are only three staff there at the moment,” Brar told newsmen." The State House press statement makes interesting reading - "Presenting the report, Chairman of the Public Service Commission Dr Max Amadu Sesay explained that the commission carried out a comprehensive investigation into the WARFP - from project inception, management and coordination, procurement processes and consultancy services, the contract award process, to the issue of bank guarantee required by MFMR, assessment of the consultant’s performance, and allegations of corruption among others. This was achieved through robust evidence gathering, he said. Dr Sesay however noted that due to lack of real evidence to corroborate most of the allegations of corruption, it was difficult for the committee to recommend more severe disciplinary action. The preponderance of the evidence submitted instead points in the direction of weak financial base of the contractor, poor financial management by the contractor and poor contractor performance and delivery." This bit takes the cake and makes a laughing stock of efforts to bring all those stealing public money to book - "The inquiry unearthed evidence of management and coordination problems with the project; a procurement process that on paper appeared consistent with established rules and regulations but was in actual fact manipulated and orchestrated; contract award based on a weak due diligence process that rendered the project doomed to failure; of a contract awarded to a firm with hardly a dollar of its own to undertake any form of pre-financing as aspects of the contract required; and of an unwitting confession by a ministry official of seeking rent for manipulating procurement process in favour of the successful contractor and providing underhand services to the contracted firm,” he narrated. He however noted that there was no real evidence to corroborate the serious allegations of corruption, thus making it difficult for the committee to recommend more severe disciplinary action." If the Public Service Chairman would want Sierra Leoneans to believe that there were no paper trails, no money trails that could have highlighted and thrown the spotlight on individuals responsible for the massive corruption that was going on with regards to this project, what was he then reporting about? What was his mandate? Protection of people who should have been in court charged with thieving? This again highlights the problems Sierra Leone faces when it comes to bringing perpetrators of corruption to justice more so when those culpable have the protection of the smoke and mirrors rat at State House. This is the kind of frustration painted by the Auditor General in her report on government finances for 2014. She called on all responsible to take their national duties seriously and act like people who love Sierra Leone first. She talks about "A slow response by those charged with governance to our message of embracing their responsibility to guide and direct the development and performance of a strong system of internal controls in ministries, departments and agencies (MDAs). This includes improving their oversight function, demonstrating effective and ethical leadership, strengthening the audit committees and insisting on credible and regular reports on the finances and activities of MDAs. The action of the executive arm of Government towards the implementation of the recommendations in the report of the Auditor-General, a report debated and approved by Parliament, has not been very effective in achieving the goals of improving public financial management reforms in Sierra Leone. Therefore the incidences of financial indiscipline continue to persist. The challenge we face is that when our report is sent to Parliament our elected representatives, meeting in committee, do not always demand a full accounting from officials for the issues raised." 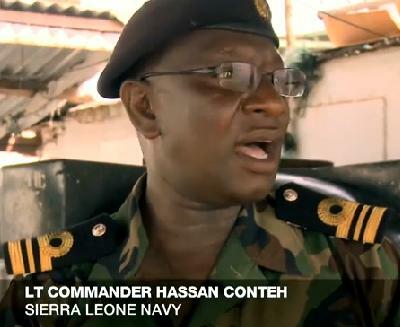 That the Joint Monitoring Centre was deliberately sabotaged, stabbed in the back by people who stand to benefit from illegal fishing in Sierra Leone waters should not come as any surprise to those who have studied and know to what extent State-House connected individuals can get to when it comes to making money through corruption. Kindly recall that even before the whole system was laid bare, the international broadcaster Al Jazeera did a couple of programmes that tracked fishing vessels operating illegally. In one of the films fish caught in our waters were put in boxes that stated the country of origin as China as they were meant for the EU market with the EU becoming very strict on the waters from which such marine products originated. "The precious marine resources of some of the world's poorest people are being targeted by industrial-scale pirate fishing operations, to feed the seafood hungry markets of Europe and Asia. The problem is particularly acute in West African waters where fish is a vital - and often the only - protein source for millions of people. In a special two-part investigation, People & Power set out in 2012, to identify and expose some of those involved in the multi-million dollar trade and to look in particular at its consequences for the impoverished West African nation of Sierra Leone. More than two years later, in 2014, the problems are still the same, and now Al Jazeera is re-airing the investigations. 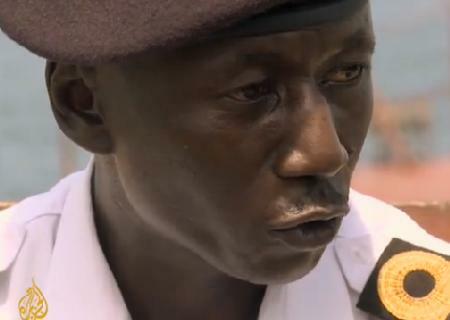 In part one of Pirate Fishing, reporter Juliana Ruhfus and producer Orlando von Einsiedel take to the seas off Sierra Leone with an NGO, the Environmental Justice Foundation (EJF), which has been trying to raise awareness about the issue. In a dramatic opening sequence they manage to catch two South Korean trawlers in the act of fishing illegally inside a coastal exclusion zone. But contrary to international maritime regulations, the trawlers have covered up ship-board markings making it impossible to determine their names and ports of origin. The vessels refuse all their requests to stop and eventually make good their escape. What follows is a remarkable piece of forensic journalism as the Al Jazeera team strives to track down and identify the vessels. Along the way they investigate disturbing allegations that the trade is flourishing because of rampant local corruption, in which officials are paid to turn a blind eye to the activities of foreign trawlers. With their time in Sierra Leone fast running out and the authorities seemingly reluctant to help, it looks as though the two vessels might evade justice." Kindly read this view from one of the film makers Orlando von Einsiedel - "Right from the start of this project, our ambition was always to do more than just show that pirate fishing was taking place in West African waters. We wanted to see justice being done, to witness and film an illegally operating trawler being apprehended by the authorities at sea. But as a quick glance at a map will show, that was going to be easier to wish for than to achieve. Our chosen location, Sierra Leone, had many hundreds of miles of coastline - a huge area for us to cover - yet only a handful of small boats in private hands with the range and speed to do the job effectively. We also realised, early into the shoot, that our presence was not universally welcomed and that there were plenty of people with an interest in allowing pirate fishing to continue unhindered. Fortunately the NGO we were working with, the Environmental Justice Foundation, gave us access to their small but fast new patrol boat. With a ministry of fisheries representative, Victor Kargbo, on board (he had the authority to stop and board an illegal vessel if we found one), we were all set to go. On our first day out at sea we received a tip off about two trawlers fishing illegally within the Inshore Exclusion Zone a few miles away. When we actually came across them, one of the things that really struck me was just how brazen they were. I could not believe how little respect they had for the rule of law or for the livelihoods of the local fishing communities they were destroying. They had deliberately covered over their shipboard markings (name, number and port of origin) to make identifying them very difficult and they ignored all of Kargbo's radio attempts to get them to stop. In fact, the crew members we could see on board just laughed at him. Their disdain was obvious and they clearly felt confident that they would get away with it. Such a level of ambivalence towards a country's laws only comes about when you are certain that there will be no consequences." The main beneficiary of this illegal operation that allows foreign trawlers to operate with impunity are not only the trawler agents, the Marine Resources ministry but the country from which the thieving trawlers come - South Korea. Many years ago, during the reign of the one Siaka Probyn Stevens even he was left open mouthed when he was given a helicopter ride to see just how much illegal fishing trawlers were in our waters. Those were the times when the Russian-associated trawlers were the main rogues. North Korea too was busy dredging the waters of West Africa with the Guinea authorities shooting to bits trawlers that refused to stop when ordered. And the new pirate and thief on the block? South Korea - and did we hear we have an embassy there? "The European Commission today lifted the threat of trade sanctions against South Korea, removing their previous ‘yellow card’ warning to improve efforts in combating Illegal, Unreported, Unregulated (IUU) or ‘pirate’ fishing. This delisting follows a series of measures taken by Korea to proactively prevent, deter and eradicate pirate fishing since the EU warning was issued in 2013. 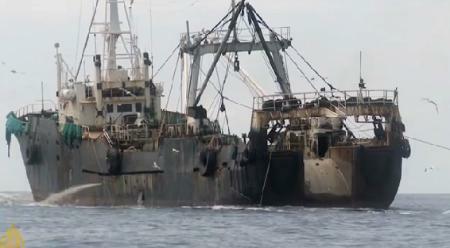 From 2010 to early 2014, the Environmental Justice Foundation (EJF) documented a large number of Korean-flagged vessels operating illegally in West Africa, particularly in Sierra Leone where EJF operates a community surveillance project to report IUU fishing activities in the inshore areas reserved for local fishers. EJF’s evidence contributed to the 2013 decision by the European Union to warn Korea that it faced trade sanctions if it did not improve fisheries management." South Korea's reputation when it comes to illegal fishing is well noted as found in this report as to why it sent medical teams to Sierra Leone during the Ebola Virus Disease outbreak. “Seoul’s investments in the region have also been tempered by a number of miscalculations. While a protracted dispute with the Nigerian state-owned oil company NNPC served as a stark illustration of the challenges of contract sanctity, the controversy that erupted in the wake of Daewoo Logistics’ attempt to secure vast tracts of agricultural land in Madagascar resulted in a backlash against the country’s Africa strategy.” Perhaps more significant is the backlash Korea faces over its involvement in illegal fishing within the region. Such enmity not only arises from the October 2013 transfer of some 4,000 boxes of illegally caught fish from Sierra Leone’s waters into the South Korean port of Busan, South Korean-flagged ships have recently been detained and charged in Liberia for fishing without valid licenses. South Korea’s involvement has become so severe that last November the EU issued a “yellow card” to Korea for falling short of its obligations in the fight against such practices. Korea’s failure to ensure the implementation of fishing policy reforms could see the EU forbidding its 28 member countries from importing fish from South Korean vessels, a trade worth around $100 million a year. Sierra Leone can perhaps learn from how seriously Ghana takes it monitoring programme. This website tells all - "West Africa Regional Fisheries Programme For Ghana"
investigate and respond. Existing INTERPOL tools and services such as I-24/7 - the secure global police communications system - notices, and capacity building for law enforcement, as well as initiatives such as the National Environmental Security Task Force (NEST) and the Fisheries Crime Working Group, have proven ability to assist countries in enhancing their response to fisheries crime. took several forms and affected different countries in different ways, but it appears that corruption is a contributing factor and must be taken into account in any course of action to address fisheries crime. This is in line with the majority of assessments of governance and law enforcement in the region. There are three main forms of corruption that affect the fisheries sector in West Africa. It is important to reiterate that not all of these forms were mentioned as issues in every country included in the study, but the different types were mentioned with enough frequency that they warrant mention. The first form is bribery of field-level law enforcement officers. This may occur unsolicited if a violation has been identified on board a vessel or in a port facility, or it may be solicited by the officer to avoid an inspection altogether. This is a significant issue for all types of law enforcement in many countries where pay is low and/or sporadic and personnel are poorly trained and equipped for their jobs. The second form involves the issuance of fishing licences and may occur at middle or high levels of fisheries authorities. As discussed in the section on licensing abuses, the lack of transparency on what companies, individuals, and vessels have been issued licences in a given country means that public accountability for the management of fishery resources is extremely limited. There are accusations that licences are issued based on bribes to issuing officials. fishing licences than are sustainable for certain waters, however this is hard to evaluate due to the lack of transparency of licence lists in most countries. This situation is exacerbated in countries that require the use of local “fishing agents”. In some countries in the region, the law requires that any foreign company or individual wishing to apply for a permit from the government use a fishing agent who will make the application to the government on behalf of the company or individual. The agents then make use of personal contacts within fisheries administrations to arrange licences. As discussed in the section on licensing abuses, there are reports that agents in several countries have produced fraudulent licences that lead to the detention of vessels and fines for vessel operators after fishing activities have begun. The third form of corruption pertains to investigations and fines for illegal activities under the purview of fisheries administrations. When the operator or owner of a vessel is accused of committing a violation of fisheries laws or regulations, there is an expectation of due process whereby the facts of the case are reviewed by an independent party and then a penalty is assessed if appropriate. In some countries, this occurs within the judiciary or some form of administrative court. However, there are accusations that operators are paying fines set by fisheries authorities without independent review, and funds from these fines are not properly accounted for by the competent authority and may constitute bribes to officials or be accompanied by side payments for reduced penalties. As in the case of the licence lists, increased transparency in the assessment and levying of fines or other punishment would significantly decrease the perception of corruption surrounding illegality in the fisheries sector. While the forms of corruption alleged may appear specific to the fisheries sector, they are merely facets of universal corruption which affects all regions and all levels of society. It also undermines political, social and economic stability and may be closely linked to organized criminal activities."